Advanced Placement (AP) courses are designed to offer in-depth exploration into subjects of interest and to push forward one’s academic ideas and experiences, according to the College Board, conductor of the AP program. Since the late 1990s, however, CESJDS has decided to not offer the classes in the high school curriculum. The choice to not offer AP classes is primarily for flexibility and to have the “autonomy” to teach advanced classes in the way the school chooses, according to Lindner. While some class curricula may stay the same over the years, JDS still has the freedom to reshape the curriculum to better meet student needs. Under the requirements of an AP course, however, the school would not. In addition, Director of College Guidance Susan Rexford said students at other schools tend to take the majority of their AP classes senior year, which JDS students would be unable to do because of the Irene and Daniel Simpkins Senior Capstone Israel Trip offered during the second semester. By his requirements, JDS would automatically be at the bottom of the list: few students take AP exams, such as only 16 members of the 82-person class of 2018. Rexford is not “impressed” by Matthew’s assessment on high schools because she says less than half of schools in the country follow the AP program. There are many curriculum options for administrators to choose from; therefore, Matthews is only exerting one measure of merit. In recent years, more schools have been pursuing independent curricula. In his Washington Post article “Millions take AP courses, but percentage of schools offering them drops,” Matthews cites that 79 percent of U.S. public schools offered AP courses in 2008, but only 74 percent did in 2012. For the majority of public high schools that do offer the some of College Board’s 38 courses, however, each teacher submits a syllabus for their course to the organization. 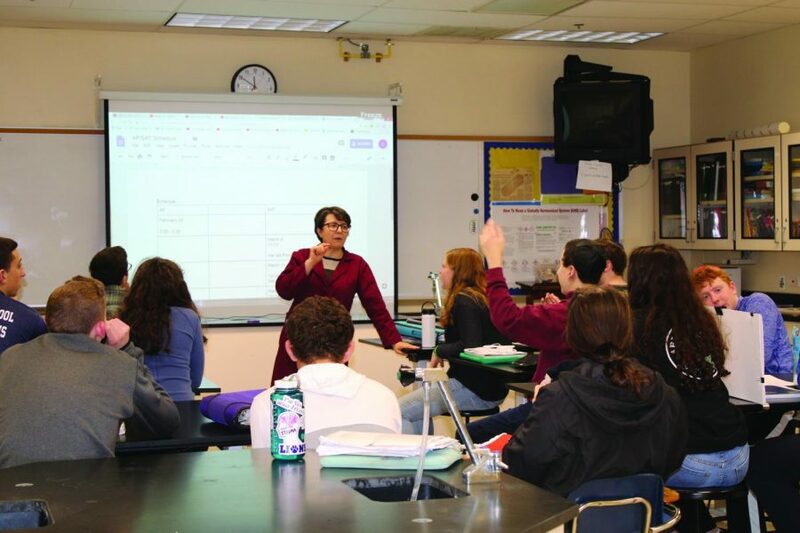 Rockville High School AP government teacher Elizabeth Seabreeze feels that the AP requirements are not restrictive, and she holds freedom while leading her classes; she creates her own course material and is able to highlight components that she chooses in the curriculum. “I definitely feel like I have that flexibility, and [students] are not just learning for the test,” Seabreeze said. According to Seabreeze, AP students can be more prepared for college because they experience deeper learning than other course levels offered. From the more in-depth textbooks to the rigorous writing, students are able to gain essential skills to help them succeed in their future endeavors. “If you are studying and teaching yourself how to study and figuring out what works for you then it will really help you for college,” Seabreeze said. Despite the advantages of AP courses in schools, due to a diverse array of curricula throughout the country, Rexford said colleges are unable to judge high school students during the admissions process based on whether or not they took an AP class in high school. Instead, students are evaluated by how much they took advantage of the offerings at their school. JDS, in its school profile it sends to colleges, makes its course offerings clear. While JDS still offers AP tests, these exams have become less relevant in the college process. According to a 2016 study of the U.S. News and World Report’s ranked top 153 universities and colleges, 86 percent of them restrict AP credit in some way, which can include limiting the number of credits students receive from their scores and requiring higher scores for credit. A common alternative to credit, on the other hand, is using exams for placement purposes. For students who do not have AP exams, they can take the college’s own placement exams, which may be required even if students do have passing scores on the AP exams. For these reasons, Rexford believes that it is hard to say that students gain a “great deal” by taking an AP exam; however, she tells her students that if they feel well-prepared for the exams through prep courses or their independent review and can handle the preparation without sacrificing their current academics, they can take the exams. “At the end of the day, I would rather see my students get higher grades second semester of junior year than I would to see them putting in multiple hours for the AP exam. If they can do both and they want to take the AP exams, then that’s fine,” Rexford said. For the students who elect to take the exams, departments tend to offer optional AP or SAT Subject Test review sessions. Alumna Abby Mintz (‘17) took the AP tests for chemistry, calculus BC, and physics 1 and 2 her junior year of high school. Although only 25 out of the 85 members of the class of 2017 took AP exams, when Mintz arrived at college she said most of her peers had the background of an AP curriculum. Mintz felt that the study sessions provided by her teachers helped a lot, but she felt ready for the exams because she said she was “self-motivated.” She bought a few review books and went through them completely on her own in addition to the prep work offered by the school. “If I hadn’t done anything on my own, I for sure would not have been prepared,” Mintz said. Mintz is a freshman at Yale University, which does not accept AP credit for courses; however, she said the extra content she learned has been very important for her. In particular, studying for the BC calculus exam, rather than the AB one, which her calculus class in high school more closely lined up with, involved a lot of extra work but was worth it to her in the end because she learned material that would not have been covered otherwise in class. JDS’ dual curriculum is what drives its classes instead of an AP program, according to Lindner. As part of an “integrated” curriculum, students studying in Judaic subjects make connections to concepts that they are learning in their general studies classes and vice versa. “Part of the strength of the school is that we do look at all of the classes; we want them to be held to the same standard,” Lindner said. When she first started counseling at JDS, Rexford sat in on a number of classes and thought there was a clear impact of the integrated curriculum on students. More than that, Rexford feels that the depth of the learning at JDS, such as the interaction between students and teachers, makes it an academically sound environment. There are a variety of ways to assess the academic rigor of a curriculum apart from APs. As such, the school looks for ways to form its classes using a combination of factors, rather than just test scores. This includes feedback from students and alumni and comparing JDS’ curriculum to other local and nationwide schools and class assessments. For example, the school can confirm how it compares to other schools when students transfer to JDS. “People who transfer into this school find it to be challenging and not just because they are taking the secular curriculum and Judaic curriculum, but because our academics are solid,” Rexford said. According to Rexford, the school knows where it stands on the spectrum from diverse college admissions in addition to the wide number of college representatives who visit JDS each year. The 2017-2018 school profile states that 96 percent of JDS students attend a four-year college or university, whereas approximately 64 percent of total students in Maryland do the same, the National Center for Higher Education Management Systems Information Center lists. Science teacher Daniela Munteanu polls her Chemistry II students on the best time for the upcoming AP review session. The students chose after school on Fridays. This story was featured in the Volume 35, Issue 5 print edition of The Lion’s Tale, published on March 22, 2018.